Some flowers all bloom in one shot, so that they are available only for a short time. Behind my inlaws’ village is an avenue lined with black locust trees; when in bloom the fragrance in the air is intoxicating. The trees look like they are covered in snow and white blossoms drift to the ground like large perfumed snowflakes. But if you’re a little late, too bad. I missed the peak of the black locusts and, while I managed to gather a handful of late blossoms, the recipe didn’t turn out the first time. Elderflowers are, fortunately for me, pretty immune on both counts. They are quite strong tasting, so while the rain does weaken the flavour, it doesn’t render them tasteless. Elderflower bushes also bloom for a longer time, although as time goes on the blossoms get higher. 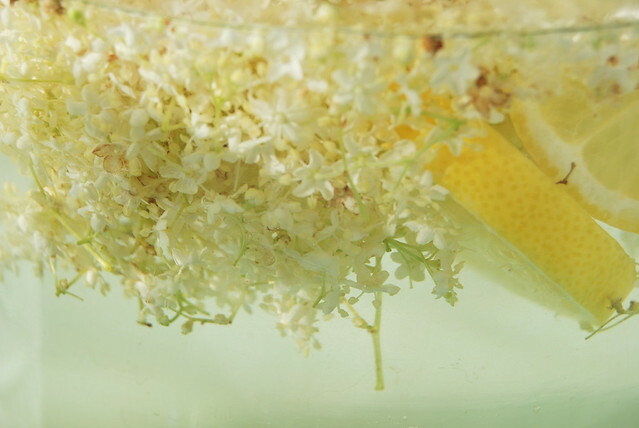 Making elderflower syrup is commonly made in Slovakia, even by people not into foraging. 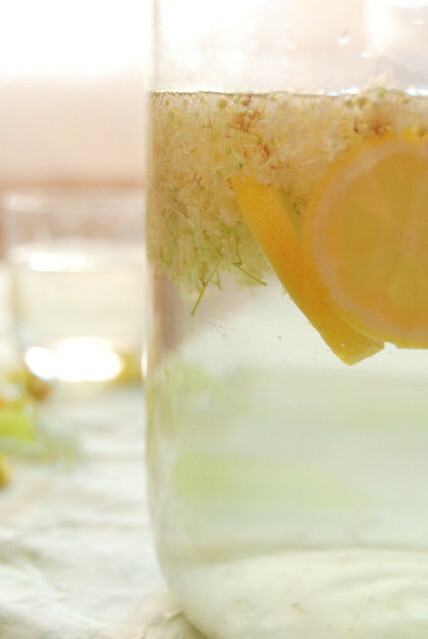 Elderflowers are steeped in sugar water with lemon and citric acid overnight and the resulting liquid is mixed with water for a refreshing summer drink. 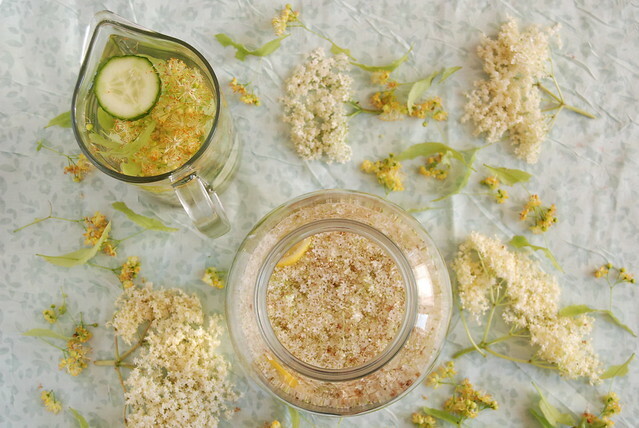 My favourite uses for elderflower are much more in line with my lazy tendencies. I’ve mentioned before that my favourite way to preserve edible herbs is to drench them in honey. Fill jar with flowers, pour over honey, stir with chopsticks. Elderflower infused honey was actually my first introduction to that method, I found the idea somewhere on the internet and took off with it. It’s ridiculously easy, stays good forever, and tastes amazing. Win all around. As the leaves, roots, and branches are toxic, I strip the flowers from the stems though you don’t have to make sure every little bit comes out. Most people here make the syrup by steeping the whole flower bunch in water, without any ill effects. 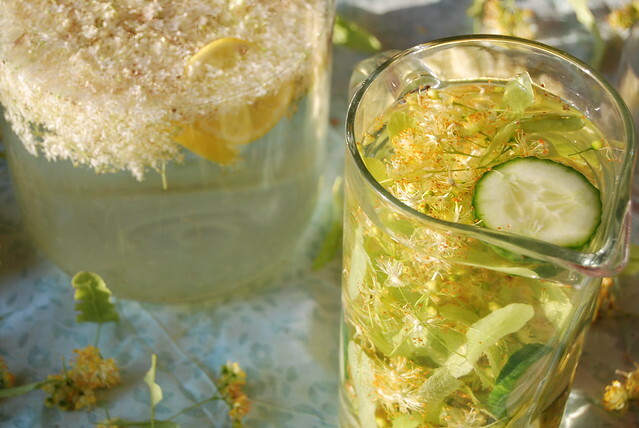 This year I also used elderflowers to flavour water. I don’t really have a recipe – I just stipped flowers from the stalk into a jar, threw in some sliced lemon, and poured water over top. Another forgiving flower to forage is the linden blossom, also called the lime flower (but not related to the citrus). The linden tree is the symbol of Slovakia and an important character in the lore of central European countries. Surrounding the main church in our town are massive old linden trees. I wonder, sometimes, how much change they’ve outlasted. When they come into blossom, a most delightful fragrance wafts in the general area. Sweet but not sickly, delicate but yet strong, their perfume attracts bees by the hive. Linden trees positively buzz with activity, but as most of the flowers are high up, it’s pretty safe. Considering a huge tree full of blossoms isn’t overwhelmingly strong smelling, the individual blossoms aren’t that strong. While picking the flowers, I sometimes wondered if it was worth it as the flowers didn’t seem to have that much smell; fortunately a little smell made for a decently strong taste. Keep the bract (the leaf like piece attached that will serve as a propeller for the seed) as they have smell and taste as well. Both flowers have medicinal properties. 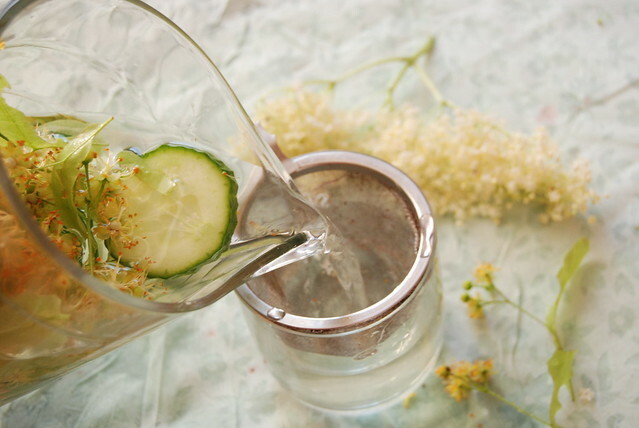 Elderflowers reduce fevers, have anti-viral and anti-bacterial properties. Linden flowers are relaxing, reduce fevers, and soothing to lung airways. Again, not really a recipe. A handful of flowers, a few slices of cucumber, a pitcherful of water. I let it steep for half an hour before drinking it. We really enjoyed this one, the twins asked for it multiple times. Flavoured water is a quick and easy way to drink more fluids when it starts to get hot, and these wild flowers didn’t fail to make drinking water delightful and refreshing. Do you use any flowers for culinary purposes? This entry was posted in Food and tagged AIP, beverage, dairy free, egg free, foraging, GAPS, gluten free, grain free, nut free, paleo, raw, spring, summer, vegetarian. Bookmark the permalink. Wow, beatiful ideas, Naomi. I can’t wait now till next year to take advantage of the early lilac blooms—I hadn’t thought of lilac as a flavour, only a scent. And the infusions are such a great way to bring that out.